A constituency-by-constituency look at the Westminster election results for each of the 18 seats in the North. Fears that Michelle Gildernew faced a near impossible challenge against the united forces of unionism and orangeism in this most marginal of seats were borne out on Friday morning when the UUP’s Tom Elliott was declared the winner by just over 500 votes. Sinn Fan had requested a re-count but it was rejected by deputy returning officer Martin Fox. The outgoing MP, who was supported by senior party figures including Martin McGuinness, vowed: “In our hearts this seat will always be Bobby Sands’”. It was a brave fight by Alliance’s Naomi Long in east Belfast against the pincer movement of the unionist pact, and her share of the vote actually increased compared to 2010 and the combined unionist tally fell to under 50 per cent for tbe first time in tbe constituency’s 130-year history. In an acceptance speech that opponents observed as “ungracious”, Mr Robinson aggressively crowed about his victory and said he was “delighted that tbe last five ‘Long’ years are over”. The SDLP party leader Alasdair McDonnell retained his seat by just 900 votes against a split unionist vote. He took only 24 per cent of the overall vote, making it one of the lowest ever vote shares to go on to claim a victory. He was greatly helped by the fact this constituency was inexplicably left out of the UUP-DUP pact, but the inclusion of Sinn Fein’s Mairtin O Muilleoir meant the nationalist vote was also split. O Muilleoir performed better than expected, taking almost 14% of the vote and reaching fourth place. While victory for Sinn Fein’s Panl Maskey, the successor to Gerry Adams, was never in any doubt, it was the performance of Gerry Carroll that impressed many. The People Before Profit candidate came second with 6,798 votes, knocking the SDLP, wbich held the seat as recently as the 1990s, into third. Sinn Fein and SDLP both saw their share of the vote drop, wbile Mr Carroll received just under 20 per cent. Mr Carroll predicted that socialism was now on the rise. “We won’t stop here. A change is under way in this community. We will keep fighting, keep building, and keep campaigning for a new politics based on our socialist principles,” he said. The DUP’s Nigel Dodds won the party’s largest-ever vote in the constituency and then accused Sinn Fein of having waged one of the ‘nastiest’ campaigns in recent memory, claiming that his rivals engaged in sectarian tactics and dirty tricks in an attempt to oust him. Mr Dodds said he thought the unionist pact had been “a very good idea”. In his acceptance speech, Mr Dodds claimed an election leaflet circulated by Sinn Fein was sectarian and also accused the party of being behind a letter sent to unionist voters making what he insisted were false claims about his record as an MP. Mr Kelly dismissed Mr Dodds’ allegations in his own post-election speech. The Ulster Unionist’s Danny Kinahan taking the South Antrim seat from DUP stalwart William McCrea was one of the shock results in an otherwise predictable election. The Free Presbyterian minister had held the seat since 2005 after defeating the UUP’s David Burnside in a constituency where the two unionist parties have always done battle. Many believed that McCrea’s high profile would see the DUP through for another term. Kinahan is notable as one of only two unionists to express support for Equal Marriage bill tabled by Sinn Fein recently. Sammy Wilson polled double the vote received by his closest rival, the Ulster Unionist Roy Beggs, whose namesake father held the seat for 22 years. The DUP’s grip on North Antrim shows no sign of loosening after Ian Paisley jnr retained the seat first won by his father 45 years ago. In traditional Paisley-style, the victor and his jubilant supporters sang in celebration after the count was declared. The DUP’s surprise decision to run against Sylvia Hermon did see her majority drop, but the result was never in doubt. The Ulster Unionist party backed the independent runner and withdrew its candidate, with party leader Mike Nesbitt claiming she remained an “Ulster Unionist in spirit”. Less than 2% of voters in this true-blue constituency are nationalists. Predictions that Sinn Fein would cut into the SDLP vote in South Down failed to materialise with Margaret Ritchie holding on for another term. The former SDLP leader topped the poll, while Sinn Fein’s Chris Hazzard polled almost exactly the same number as his predecessor, Caitriona Ruane. Following a controversial campaign that saw him resign as Stormont health minister, the DUP’s Jim Wells came in fourth behind the Ulster Unionists. DUP’s Jim Shannon retained the safest of seats in this staunchly unionist constituency. DUP’s Jeffrey Donaldson managed to increase his party’s huge majority in Lagan Valley by more than 2,500 votes in the first result of the count in the North. DUP man David Simpson was returned to Westminster by a relatively narrow margin from the UUP and SF in third place. Simpson described it as “a fantastic victory”, but he also lashed out at “despicable attacks” on his family of adopted children from unionist quarters and said the campaign had “stooped to the gutter”. 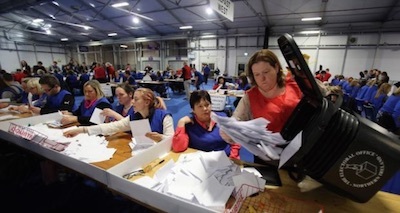 Sinn Fein held on to this constituency with a comfortable majority, as Mlckey Brady saw off the challenge of All-Ireland winning footballer Justln McNulty with more than 8,000 votes to spare. However, the most interesting development of the count came from Danny Kennedy, who almost doubled the Ulster Unionist vote. The SDLP’s best performance of the election was in Foyle where Mark Durkan increased his party’s vote, although the turnout was down by morethan 4 per cent on 2010. Durkan said Sinn Fein made a “mistake” by claiming that Derry was now a “Sinn Fein city”. Sinn Fein’s Gearoid o hEara congratulated his opponent on his vIctory and said he was pleased that the party vote had held up in Derry. This was the only constituency where the nationalist vote share was up overall. There was never a doubt tbat tje DUP’s Gregory CampbeJl would retain his East Derry seat. However, tje nature of his victory was impressive. The result placed him almost 8,000 votes abead of the nearest candidate, Sinn Fein’s Caoimhe Archibald. It also left the DUP hardliner in fighting mood as he told supporters his party was “on the way up”. Veteran Sinn Fein campaigner Francie Molloy strolled to victory in Mid Ulster. Although his party’s latest share of the vote was down three per cent on the byelection count in 2013, Mr Molloy came home with almost half of the ballots cast.